Do you find yourself walking, running or biking the Guadalupe Trails within the Guadalupe River Park at least once a week? The Guadalupe River Park Conservancy is launching a Trail Ambassador Program where individuals like you act as the eyes, ears and friendly face of the park. Volunteers help report issues along the trails, hand out trail maps to other trail users, and be a friendly presence in the park. The commitment is mostly flexible but would require at least 45 minutes a week. Click here for the patrol report form. • Riding your bike, walking or running/jogging. • Making the park a more enjoyable place. • Being involved in the management of your local trails. Yes, we have a short informational form that we require all our trail patrol volunteers to fill out. This form is to help us understand how you will be participating in this program. If you don’t want to formally sign up, please consider reporting issues via the San Jose Clean mobile app when you use the trails. Yes, we ask that all our trail patrol volunteers wear our green trail patrol vests; this way other trail users can identify you. Do I need to check in at the Visitor’s Center or can I start from my house? You do not need to start at the Visitor’s Center; you can start anywhere you would like. Just be sure to note your starting location and time on your report form. What is a Trail Ambassador Kit? What is in it? A trail ambassador kit is a collection of items that is available to trail patrol volunteers to help them accomplish different tasks. It may contain things like park maps, a first aid kit, bike tire repair kits, graffiti removal, etc. It can be tailored to what tasks you are willing to do. For instance, if you are willing to pick up litter during your patrol, your kit would include a litter grabber and garbage bag. If you are more into reporting issues and handing out trail maps and not as interested in picking up litter or removing graffiti (a likely scenario if you are on a bike), you would not take those things. 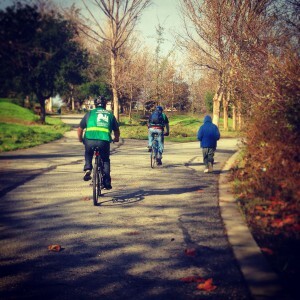 Can I patrol the trail with my friends and family? Yes, you are welcomed to patrol with friends and family but they must also sign up to be a part of the program. Do I need any tools or materials of my own, such as a smart phone, to participate? No, we will provide everything you need. If you have a smart phone and are willing to use it, great! If not, we will provide a point-and-shoot camera. Likewise with any other items you may need. However, this might require that you begin your patrol at our Visitor Center. Yes, there are some restrooms in the park but because they are sporadically placed we recommend using the restrooms before your patrol. Will I see wildlife in Guadalupe River Park & Gardens while on patrol? Depending on the time of day, you might see critters. Trail users have reported seeing wild turkeys up by Hedding Street, and skunks are fairly common at dusk. Will I have to interact with other trail users? We ask that our Trail Ambassadors participate on an “at comfort basis”, meaning volunteers only engage in activities that they are comfortable carrying out. To some degree Trail Ambassadors may need to interact with trail users as Trail Ambassadors will be wearing their Ambassador Vests. What are my basic responsibilities as a trail ambassador? • Patrol on foot or bike on assigned trails and report suspicious or unusual situations via our report form or the Clean SJ app. Emergencies should be reported to Law Enforcement. • Provide non-enforcement and non-confrontational services to the public. • Notify Law Enforcement of any trail hazards. Will you schedule my patrols or do I continue my normal hikes/rides? You can continue your normal hikes. Every so often we may ask you to help us patrol a specific area in the park. How often must I patrol to stay active–how many hours? We ask that you patrol at least once a week and contribute at minimum 3 hours a month. How do I report my hours and things I see while on patrol? I’m not sure I’m ready to go out on my own, will someone go with me? If you do not want to patrol on your own, we will try to pair you with another Trail Ambassador who patrols your area of interest.